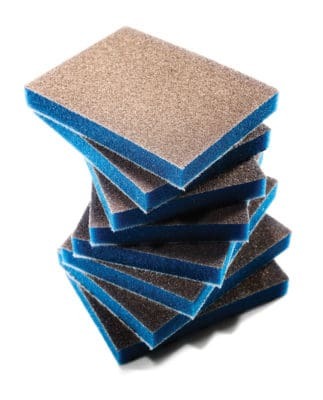 Uneeda offers a wide variety of abrasive sponges suitable for sanding curved, contoured or flat surfaces. Our sponges were engineered for wet and dry applications on wood, metal, drywall, and various solid surfaces, and are all washable and reusable. Uneesponges are available in thickness of 3/16″, 1/2″ and 1″ with aluminum oxide and silicon carbide abrasive grains and a variety of grades while EKASILK sponges are available in 5mm & 1/2 thickness. Our sponges are the ideal products for obtaining the smoothest finishes in the woodworking, automotive and marine industries. They can be used for removing raised fibers on white wood as well as for paint, stain and sealer sanding.